It happens to the best of them; an application simply stops responding to input. You may not be able to access the application's menus or the application just seems frozen. Sometimes you will even see the SPOD (Spinning Pinwheel of Death), an indication that the application is frozen, or at least hung up waiting for something to happen. When all else fails, you can use the Force Quit option to terminate a rogue application and return control to your Mac. There are multiple ways to Force Quit an application. We will list just the two easiest methods here because one or the other will almost always work. Each Dock icon has the ability to display contextual menus that you can use to control or gain information about the application or files the icon represents. You can view contextual menus by right-clicking on a Dock icon. When an application has stopped responding to user input, a Force Quit option will be available in its Dock icon's contextual menu. Simply right-click on the application's icon in the Dock, and select Force Quit from the pop-up menu. 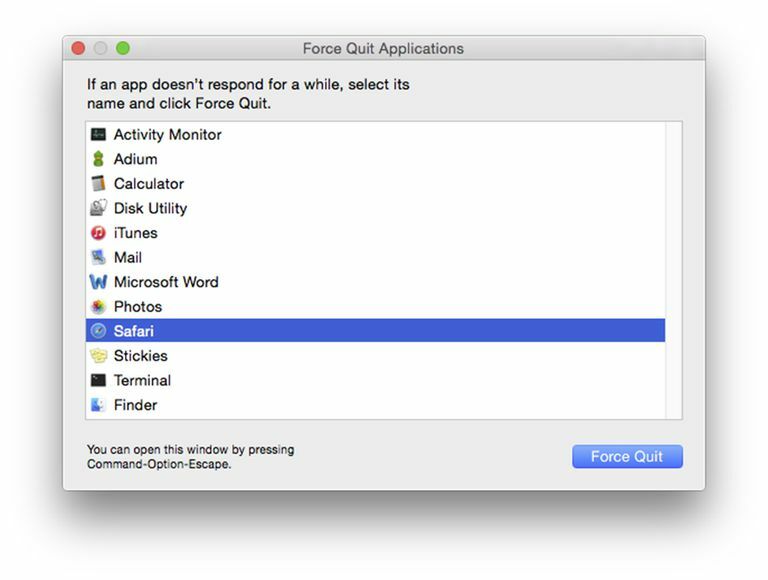 The Apple Menu also has a Force Quit option. Unlike the Dock method, the Force Quit option available from the Apple menu opens a window that lists all running user applications. We say "user applications" because you won't see background applications that the system runs on its own in this list. Select Force Quit from the Apple menu. Click to select the application you wish to Force Quit from the list of running applications. You will be asked if you really, truly want to Force Quit the application. Click Force Quit. That should cause the selected application to stop running and close.